The revitalization of Toronto’s waterfront is one of the largest urban redevelopment projects underway in North America. To lead the project, Waterfront Toronto was established in 2003 by the governments of Canada, Ontario and Toronto. Almost $1.5 billion in tri-government funding has been invested in waterfront revitalization, attracting thousands of new residents and jobs and governments have allocated a further $1.25 billion in funding over seven years for Port Lands Flood Protection. Overall, considerable momentum has been built. However, with the forecasted addition of 40,000 new residents and 40,000 new jobs, revitalization is far from complete. There is a need to maintain momentum and invest in the infrastructure that future residents and businesses will need. The Sidewalk Toronto Master Innovation and Development Plan, including the results of public consultation and specific public outreach and engagement on data issues. The City’s participation in waterfront revitalization is managed by the Waterfront Secretariat, part of City Planning. The Waterfront Secretariat coordinates across City divisions and agencies (CreateTO, for example) and works closely with Waterfront Toronto, as well as other government organizations (PortsToronto and the Toronto and Region Conservation Authority, for example). 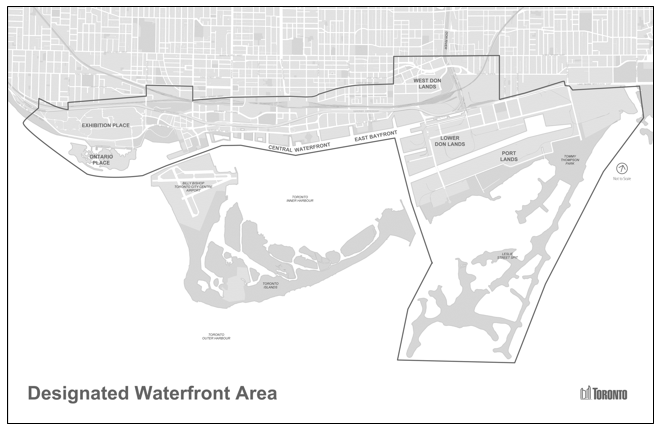 The mandate of Waterfront Toronto is specific to the Designated Waterfront Area, stretching from Exhibition Place to Leslie Street. Port Lands Flood Protection will enable the redevelopment of the Port Lands and South of Eastern area including the Unilever Precinct. The project will provide flood protection to the regulatory storm event level (the equivalent of Hurricane Hazel), a precondition for redevelopment. In June 2017, the Federal Government, Provincial Government and City announced $1.25 billion funding for the project over seven years and a funding contribution agreement, approved by City Council, was executed on May 1, 2018. The project, led by Waterfront Toronto with the support of a Port Lands Executive Steering Committee (with City representation) will manage key areas of risk, including those associated with soil and groundwater conditions, and coordination with other capital works in the Lower Don area. Detailed design is well underway, and components of the project are now under construction. A number of infrastructure projects planned for the Lower Don area (generally, the area bounded by Parliament Street to the west, Leslie Street to the east, Queen Street to the north and the Port Lands Ship Channel to the south) are underway as a result of federal, provincial, City and private sector investments. These include Smart Track, flood protection and the rehabilitation of the F.G. Gardiner Expressway and Lake Shore Boulevard. While these projects will be proceeding over decades, the period from 2018 to 2025 will be particularly intensive. The City of Toronto Waterfront Secretariat, working with the City’s Major Capital Infrastructure Coordination Office and the proponents of the various capital projects, has been facilitating the review of project schedules, budgets and scopes of work to ensure that these projects are coordinated throughout planning, design and implementation. In addition to Flood Protection, the Port Lands will require infrastructure to support 50 plus years of growth including an expanded road network; the introduction of higher order transit; new water, wastewater and hydro services; new community services and parkland; and the provision of affordable housing. These investments will enable the creation of new mixed-use communities, while also providing ample servicing for film, industrial and port users. Given the volume of infrastructure projects and the interconnectedness between them, investments will need to be phased and sequenced, and a variety of funding mechanisms will need to be utilized. In October 2017, Waterfront Toronto selected Sidewalk Labs as its “innovation and funding partner” for Quayside, a 12-acre site in the City’s waterfront. The partnership, called Sidewalk Toronto, has attracted significant media and public interest as Sidewalk Labs is a subsidiary of Alphabet Inc., which also owns Google. Waterfront Toronto and Sidewalk Labs recently (July 31, 2018) executed a Plan Development Agreement which defines their relationship over the next year as they jointly produce a Master Innovation and Development Plan. In 1983, the City, Toronto Harbour Commissioners (later PortsToronto) and the Government of Canada entered into a Tripartite Agreement for a term of 50 years with no provisions for renewal. Pursuant to the Agreement, the City has leased a portion of the Toronto Islands to be used as airport lands by PortsToronto. The Agreement governs the operation of Billy Bishop Toronto Centre Airport by PortsToronto and contains specific terms regarding: types of aircraft permitted to operate at the airport (including a prohibition on commercial jet aircraft); hours of operation; noise limitations; secured rights of access, and a prohibition on expanding the airport’s current landmass. Ports Toronto has a standing request with the City of Toronto to negotiate terms of a possible airport lease renewal beyond the current June 2033 expiration date. No lease renewal negotiations have taken place. Transport Canada is expected to introduce Runway End Safety Area (RESA) legislation for all larger commercial airports which – contrary to current lease prohibitions – may require expansion of the landmass at Billy Bishop Toronto City Airport. Any such proposal will require careful evaluation against current lease conditions. In July 2018, City Council approved the Final Report on the Bathurst Quay Neighbourhood Plan Study. The study includes a vision, guiding principles and actions for improving the neighbourhood across the channel from the airport. Council also made a number of requests of City staff, including the creation of a near-term streetscape and public realm improvement strategy for the Bathurst Quay neighbourhood. The City of Toronto, in partnership with the Toronto Transit Commission and Waterfront Toronto, is undertaking the Waterfront Transit “Reset” study, including a comprehensive assessment of needs and options for transit improvements for the waterfront area. A Phase 1 study was completed in 2016, and the Phase 2 study was completed in January 2018 when City Council endorsed the overall Waterfront Transit Network Plan, including directing City staff to complete the evaluation of a preferred transit solution for the Bay Street section of the network from Union Station to Queens Quay. Waterfront Transit is not a single continuous line but an integrated network of connections that can be implemented in separate phases. Portions of the transit network have been completed, but major improvements and the completion of missing sections are required to support waterfront revitalization and continued economic success of the city as a whole. Phases 1 and 2 have been completed for the Waterfront Transit “Reset” study. Phase 1 provided the preliminary network plan, and City Council approved the direction to advance the design of the existing Harbourfront transit line from Exhibition Loop to Dufferin Street to a 30 percent level. Phase 2 completed the plan and cost estimate for the entire Waterfront Transit Network, and prioritized projects into the 10 years and greater than 10 years time periods. City Council has approved $416 million in funding for Port Lands Flood Protection, including the 2016 approval of the Cherry Street Stormwater and Lakefilling project as a quick start component. In 2015, City Council affirmed Waterfront Toronto as the preferred delivery entity for waterfront revitalization, assuming a scenario of tri-government funding and governance. Council also directed the City Manager to review Waterfront Toronto’s real estate development responsibilities in parallel with the City-Wide Real Estate Review, to ensure alignment with the real estate roles and responsibilities of City agencies, corporations and divisions, including CreateTO. Council consideration of the Final Report for the Unilever Precinct Planning Study Secondary Plan and Planning Framework, and East Harbour Official Plan and Zoning By-law Amendment Applications.